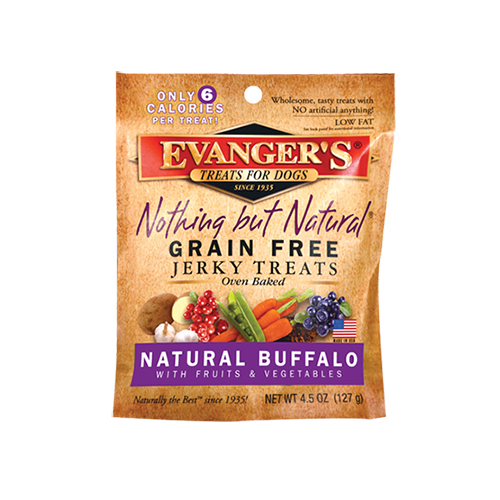 Jerky Treats – Evanger's Dog & Cat Food Company, Inc. Starting with chicken raised exclusively on certified organic feed, we add wholesome ingredients like farm-fresh carrots and peas. This is a low-calorie guilt-free and grain-free treat! Starting with naturally raised buffalo, we add wholesome ingredients like farm-fresh carrots and peas. A low-calorie, guilt-free, grain free, exotic meat treat your dog is sure to enjoy. Along with Venison, a unique meat, we add farm-fresh blueberries and cranberries. This is a low-calorie guilt-free and grain-free treat! The easy way to sneak fruits and veggies into your dog's diet!